Requested to include this seperate from blog. Now then Ray, this is how to take a robin photo - absolutely perfect. Got to go on my favourite pics. He's Beautifull BB.. Great Pic .. Thank you very much Ray, gone to my favourites. Must tell you why, when I was born my mother didn't know what to call me and as she was thinking a Robin came on the windowsill and that was what I became. Many thanks again. Thanks for kind comments ..what a lovely story Drb aw you lying there as a little baby and a robin on the window sill ..so glad you asked me now as obviously means a lot to you ..
Lovely little face so cute lovely photo. Lol Bonkersbon I remember Robin Starch he he. He he Dee ..already have an Uncle Batty ( Bartholemew ) . On my fav's too ! Thanks Milky and Aster . This is SO spoooky F/crazy. Sent you a PM just before I saw this pic. This is just gorgeous Ray! Something for me to apsire to.....the quality of your photo's, not the robin!! Although, as these little things are so well loved, it's not a bad thing to aspire to be if you wanted to be a bird!! Wonderful photo.....now on my favourites. Gosh you turn your back for a minute ..where to start ? well thank you all - really Jane should take the credit as wildlife just seems to sense she loves them.They flock to her . Most of spare time spent with them ..well wouldnt you if you had me indoors ..lol Every evening out with food along the wall and the voles and woodmice scurry around her lovely to see . Shes the reason we able to get so close . Apologies for not answering individually ..and nice to see you back OB . Thanks for that info Deida...didnt know that No wonder they can spot things so well ! Aw San...maybe he just waiting to look his best for you ! gone on my favourites too ~beautiful! lovely but i always think of them as she's. i have a female that regularly keeps me company. when she was booding she regularly came for worms from me. she did look a sorry sight with lots of ruffled feathers. she has a white feather in her 'eyebrow' and she has been with me for 3 yrs now. there are others but round the side of the house that is her territory. Awesome photo BB! A gorgeous little bird as well! Forgot to say he's on my favs now and nice to be back, albeit it intermittently for a short while. Need to find some spare hours to catch up on here and add some bits meself! Absolutely beautiful photo BB.....gone straight on my Favs. Wow BB what a fabulous photo...love how I can see the sky's reflection in its eye, very nice...added to my favs as well!! I saw one of these at my work for the first time in this area...didn't think they lived around here. No camera though!!! Thanks Tg .. really saw one near you ? I too never knew you had them in US wonder how they got there ..been introduced ? would never be able to fly across ..
A wonderful portrait of what is surely one of the gardeners favourite bird. The American Robin (Turdus migratorius, also called North American Robin) is a migratory songbird of the thrush family. It is named after the European Robin because of the male's bright red breast, though the two species are not closely related. The American Robin is widely distributed throughout North America, wintering south of Canada from Florida to central Mexico and along the Pacific Coast. It is the state bird of Connecticut, Michigan, and Wisconsin. It has seven subspecies, but only T. m. confinis in the southwest is particularly distinctive, with pale gray-brown underparts. 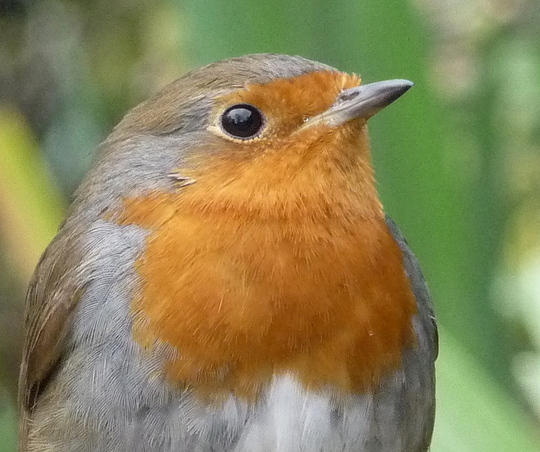 The adult robin is preyed upon by hawks, cats and larger snakes, but when feeding in flocks it is able to be vigilant and watch other birds for reactions to predators. Brown-headed cowbirds lay eggs in robin nests (see brood parasite), but robins usually reject the cowbird eggs. Thanks Arlene didnt know American robin was a member of the thrush family but then if got to grips with latin names better I would . The only one that ever stuck was Subbuteo for the Hobby falcon , due to the football game..oh and Troglodyte for Wren. As such different birds assumed Tasteyg would know an American robin surprised to read she had seen one of ' ours ' . I ll now have to look up cowbirds ..thanks for info. Thanks for all that information Arlene, thatt's fascinating stuff. So glad I asked for this lovely photo again. On my favourites as well, an excellent shot of our all time favourite bird, thanks for putting this on. Fantastic picture, such detail - you can even see the individual feathers. Thanks Tcg....he is very tame and seems to pose for his pic taken ! ABSOLUTELY PERFECT~!!! what a sweet little creature. thanks! and the same to you, BB and Jane... we are having a horrible storm, at the moment...very high winds whipping the snow around...makes me thankful I'm indoors...pity the little creatures out in this! Hope things calm down for you Lori. Our garden is always full of birds in cold,snowy weather,and they need all the help they can get to survive it all. Yes...I making seed'n'suet balls to hang on my christmas tree...when I'm finished with it of course!! going to put it up outside and decorate it for the birds~! Great idea...you must post a pic ! Fantastic pic Bonkers. Gone on favourites. The one I was feeding at work earlier in the year is now so tame that he is in danger of being trodden on. I take him mealworms which he takes from my hand. Yes. I feel so priviledged that he trusts me. Cant really get better than this , everyones already said what there is to say. But as one Yorkshireman to another "It'll do"
Praise indeed ! Thank you. So that's where that phrase came from!...it was a favourite of my dad's ...lol. far as I know though we came from Sussex! Sorry mate for not making a comment to this picture. I am so involved with other forums that I only have a couple of minuits to scan through here. This bird is possibly my favourite in Britain because my sir-name is Robinson so there is a connection between us. Thanks for all your comments, and like I once wrote in the Bird Forum, "It's addictive". This picture will now be in my favourites. What a lovely connection...thanks for this Tanny. Hello again, Bb and Jane! I realized I missed the boat...forgot to get pics of the second duty Christmas Tree...anyway...the birds used it for shelter and enjoyed the treats...it is now partially pruned away... I mulch the small twigs and use it under my rhododendron to help acidify! Our lovely robins are back now!! they are busy collecting grass, strings and mud... soon we will have baby robins bathing in the pond like we did two summers ago! Hi Lori...glad your robins have returned...hope you can post pics of the babies bathing this year !! For Sure!! keep your eyes glued to this site! LOL!!!! btw...don't think I commented on the perfection of this picture! Big Wow.... who was behind the camera...Ray or Jane??? Will do Lori...Jane took this one ! A smashing photo Bonkersbon. Well taken. Hi Jane and Ray.... the robin youngsters have come many times to the bird bath but for some reason they are very shy. By the time I run for my camera they say: "oh oh....there's that peeping tom again!" and fly away in a flurry of beeps and splashes~...I"m still trying, but they are practically adult birds now...very large and healthy looking. Thanks Brinjay taken a while ago and all future bird pics now on sister site Ispyabird.co.uk. Thank you Lori there is now a new category for overseas birds on Ispyabird so if you ever do get those elusive shots would love to see them and you of course , there. yes, I joined up when it first started but I've been away a while and my memory for passwords is troublesome....really must go back and check it out. We recently had a computer virus stopped everything had to take everything back to original settings ..thought would make password an obscure bird , so obscure couldnt recall it either ..so you re not alone . Thank you Jackie .. a while since this was taken and since then a new web site for birdlovers also operated by Ajay and Peter called Ispyabird introduced. We submit our bird photos through there now and leave GOY free to gardening.